Hay, the staple winter diet of domesticated horses for over a thousand years, came in last in a university study exploring equine preferences for conserved forage. The winner in the carefully controlled study was baleage with a moisture content of 65 per cent, followed by grass which was baled and wrapped when drier (haylage), and then hay. The research was carried out Dr Cecilia Müller and Dr Peter Udén, of the Department of Animal Nutrition and Management at the Swedish University of Agricultural Science in Uppsala. The making of baleage and haylage involves wrapping grass to deprive it of oxygen, resulting in acidification of the forage (ensiling). The baleage was baled when the dry-matter content was 350g/kg (a moisture content of 65%). For the study, two lots of haylage were made and fed to the horses, each with a different moisture content at the time of baling. The first lot was made at 550g/kg (45 percent moisture content) and the last lot at 700g/kg (30 per cent). All bales were wrapped within two hours of baling. The hay was baled at 870g/kg (13 per cent moisture content) and placed in a shed drier for nine days. All four feeds given to the horses were made from the same paddock and at the same level of grass maturity. The researchers gave four horses the four forages once daily during four consecutive five-day experimental periods. Each sample contained 1kg of dry matter of each forage. The horses were watched for two hours after the feed was given. Their first choice, eating time, and the percentage of each forage eaten was noted. The researchers also noted the number of times a horse tasted or smelt one of the offerings, but left it in favour of another. The study found that baleage was most popular, with the horses cleaning up 90 per cent of the offering, and taking, on average, 28.4 minutes a day to do so. It was the first choice 85 per cent of the time (72 out of 84 instances). It was never left in favour of either haylage or hay. Hay was least favoured, and the offerings of hay were never completely consumed. The horses, on average, consumed only 23 per cent of the hay (based on dry matter) and ate it for only 6.8 minutes, on average. The haylage offerings fell in between. The formal published report of this study refers to silage, haylage and hay. The silage referred to in the study involved bales wrapped with a moisture content of 65 per cent, which New Zealanders would call baleage. 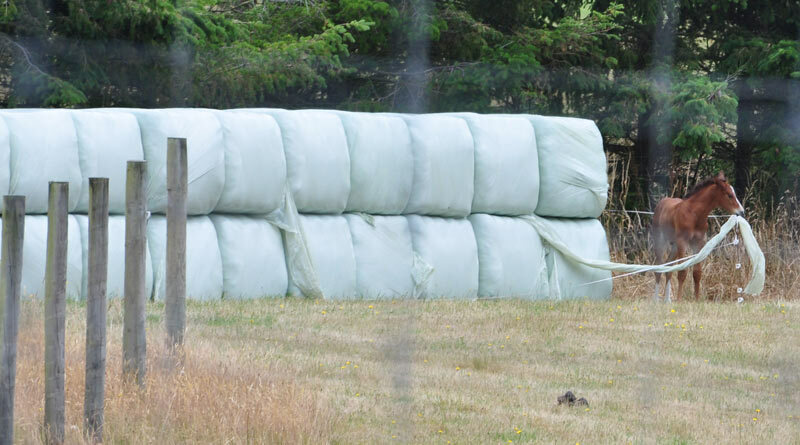 References to this wrapped silage have therefore been changed to baleage for this Horsetalk report. In New Zealand, grass is normally baled for baleage with a moisture content between 30% and 60%. The study also refers to haylage. The term haylage is less common in New Zealand, and in this study refers to two lots of grass baled and wrapped when drier – at moisture contents of 45 per cent and 30 per cent. New Zealanders would, again, generally call this baleage, but we have retained the term haylage here for simplicity. All bales used in the study were made with a high-density conventional baler. The term silage is normally used in New Zealand to refer to chopped grass which is stored for ensiling in a large covered pit. This form of forage did not form part of the study. Haylage made with the higher moisture content (45%) was eaten, on average, for nearly 21 minutes, with 62% of it consumed. The haylage with 30% moisture content was eaten for 10.45 minutes, with only 34% of it consumed. Drs Müller and Udén said the way in which forage is conserved clearly affects a horse’s preference, but the reason for the high-moisture baleage preference has yet to be explained. The pair note that horse owners have sometimes claimed that baleage will not be eaten by their horses. However, they point out that published comparisons of voluntary intake have included forages with very different nutrient composition, and a strict comparison of preservation methods had not been done. Comparisons which have been done involved crops harvested at different stages of maturity, and at times involved comparisons of completely different crops altogether. Hence the Swedish study used the same grass crop for the production of all forages used in the study. The four horses in the study comprised two warmblood riding horses (a mare and gelding), one Hanoverian mare and one crossbred Arabian/Warmblood gelding. They were aged from 4 to 23 years and weighed between 430 and 650kg. All horses had been on summer pasture for about three months before the beginning of the experiment, and remained on pasture during the experimental period, except when under observation around the forage, during which time they were stabled. After each five-day experimental period, the horses had two days on pasture before the next experimental period began. They were always given the forage at the same time of the day, served in containers of the same size and colour. The order of the forage containers was changed each day. The researchers also monitored the chemical composition and microbial content of the grass immediately before baling and from the bales as they were fed out. “Preference of horses for grass conserved as hay, haylage or silage”, by Drs C.E. Müller, P. Udén, was published in Animal Feed Science and Technology (2007) 132, 66-78. Article first published on Horsetalk.co.nz in March, 2007. My horses prefer hay dipped/soaked in water or pellets of hay soaked in water. Why? The same reason for haylage. Horses are grinders and wet moisture filled haylage or hay is easier to grind like natural pasture consumption. WE humans dried just for storage. Horses eat hay such as alfalfa easier because its softer and has more moisture dry baled than grass drird bales. Horse common logic.